Report on the “Honest Business in a Time of Strife – Building a Values Culture in your Business” business matters lunchtime talk given by Brent Haywood on 22 May 2013.
business matters is very grateful to Pinsent Masons who hosted the event and provided lunch for those attending. To view the PowerPoint presentation which accompanied the talk and hear a (27 minute) recording of the talk, use the icons at the foot of the page. A rarity in the world of commerce? Coming, as it did, in a month where there had been significant media coverage of companies such as Apple and Google appearing before American and British Government bodies respectively in connection with concerns about tax avoidance policies, this talk from Brent Haywood was certainly current in its topic. Brent started by highlighting the extent to which the public are aware of these issues by telling us that his 13 year old son had, without prompting, when he heard the subject for the talk, volunteered the name of a well-known multinational company as one which was involved. A look on the internet at the blogs of certain financial and economic commentators highlighted the perception that companies were aggressively pursuing policies which took profits and money “up into the stratosphere” such that they were untouchable and minimal tax was paid to countries where that money had been generated. While such strategies are not illegal or underhand the companies concerned are now coming under enormous social pressure. Brent moved from the negative (as he said, he could have spent the entire talk cataloguing instances of negative behaviour) to the positive and asked the question – what can we as individuals and businesses do? As he tried to answer this he drew on Neil Ferguson’s book Civilisation in proposing a principle: what economic historians will tell you is that commerce flourishes best when there is trust between parties. Imbedded in capitalism is the competitive spirit, but when it becomes excessive it tends to induce unethical business practices, when that happens the normal rules are flouted, skirted or simply disregarded. The ensuing instability is bad for the economy. The character or virtue approach. “What I strongly urge is that bankers, particularly senior bankers, should be made to stick to an equivalent of the medical code of ethics. This is important from the point of view of restoring trust in the banking system. If there’s a sense they can walk away with lots of money and no punishment when they have done something wrong, that strikes me as morally and ethically wrong, That is something which really ought to change”. Brent quoted the Google strapline “do no evil”. This is a code in some senses. He highlighted that while compliance to regulation might direct us towards honesty and integrity we know that that is not always the case because around us we see all the time that the code is honoured to the letter of the law but not to the spirit. Following a code, any code, can take you a good distance in the right direction but it’s a mistake to think it gets to a destination. Sleeping test – if I do this can I sleep at night? Newspaper test – would I do this if it were splashed on the front page of the newspaper? Mirror test – will I feel comfortable with myself when facing the mirror? Child test – if I did this would I mind telling my teenage children? This approach has the strength of encouraging personal responsibility and being concerned for an outcome which increases wellbeing but it is very subjective and one person’s “honest” decision may not align with another’s perception and, in fact, may be regarded as unethical. This is highly sought after as can be evidenced by the huge sales of biographies of people like Steve Jobs or Richard Branson. In fact there are over 15,000 biographical titles on Abraham Lincoln alone. Companies talk much about values these days – trying to take “character” and distil it into positive outcomes. Brent suggested that, while values can sound very good, firstly they must always be challenged to test if they are meaningful for all and, secondly, since values tend to be relative, it may be better to focus on “virtues” since they have understandable opposite “vices”. Virtues focus on character, not rules. Brent highlighted that Christian tradition has emphasised four of these: justice, prudence, moderation and courage and added the theological virtues of faith, hope and charity. Much of this is wrapped up by the word integrity – the integration, wholeness, and soundness of a person who is free from moral corruption. This is encapsulated by the Old Testament principles from the book of Micah: “to do justice, to love mercy, and to walk humbly with your God”. Having identified the ways in which we attempt to do the right thing, Brent focused on the place that the culture of a business has and how it impacts on how the practice of business is carried out. He highlighted the public art which is on display at Standard Life as an example – looking more closely you will discover that much of it is themed on the types of virtues identified above, making a statement about the type of culture that the organisation wishes to promote. Issues can arise when the underlying culture of an organisation and its stated values are at odds. In the phrase of one commentator this gives rise to “organisational dissonance” – translated by Brent as “chaos”! Brent proposed that the whole area of culture and practice comes down to a basic assessment: how things are done around here. He challenged us to aspire to build a culture of integrity – something which can apply to us wherever in the organisation we may exist. He shared a simple model which he has used himself for living it out in the workplace – a Greek Temple – the diagram can be accessed at the foot of the page. Then the ceiling of operational excellence (we do things well around here with character) can be supported. 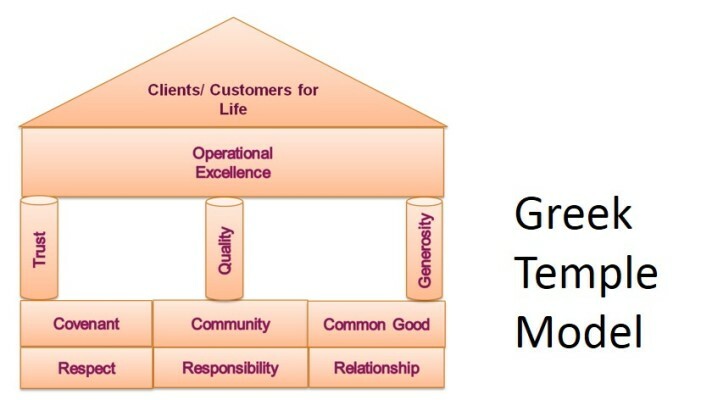 Finally, the roof is the result – customers and clients for life. As Brent finished what had been a stimulating and challenging talk, there was a lively time of question and answer.